Exposure to the elements and UV rays can weaken PVC physical properties over time, resulting in fading, discoloration, and degradation. These damaging effects can be prevented by utilizing weather resistant PVC materials for the manufacturing of outdoor goods such as patio furniture, gazebos, fencing, deck railings, and other outdoor products. The physical properties of PVC make it a versatile material that mixes well with other substances to create the desired material with features such as flexibility, impact resistance, and weather resistance. Acrylic-based impact modifiers added during the manufacturing process along with pigments and colorants to provide additional protection from sunlight and other elements, creating weather-resistant PVC. One pigment that is commonly used to alter PVC physical properties is Titanium Dioxide, which helps reflect natural light and absorb UV rays to protect the PVC. Additional stabilizers or brighteners may also be added during the extrusion process to increase UV resistance to further safeguard against degradation and UV damage. Due to its versatile physical properties, PVC provides the durability and longevity needed for a wide range of plastic material applications. Crescent Plastics offers extruded PVC tubing that is specially formulated to be weather- and impact-resistant for longevity. PVC is known for its durability and ability to maintain its performance over an extended period. In addition to weather resistance, PVC is resistant to almost all inorganic chemicals and is a highly stable product that is impact resistant, fire-retarding, and resists microbial growth. Our weather resistant PVC materials are versatile and able to accept a range of surface treatments to customize your extruded tubing further. Its function is further improved with the addition of additives, and the combined factors make it an ideal material choice for outdoor tubing applications. 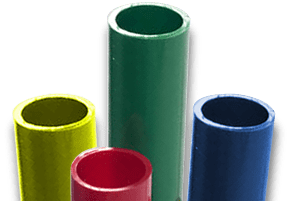 We offer plastic pipe extruding for PVC materials and can add customized characteristics to your tubings such as custom colors and printing; custom shapes, lengths, and diameters are also available for our weather resistant PVC. Contact Crescent Plastics to learn more about our PVC, and ABS tubing and available options for UV resistant extruded tubing or request a quote for weather resistant PVC tubing. TPO is an excellent material for cold temperature impact (down to -40° F), low thermal expansion and has an optimum balance of stiffness and flexibility. This weather resistant material is excellent for tough applications where your product needs to be rugged. Acrylic is an excellent material with outstanding strength, stiffness, and optical clarity. Acrylic has superior weathering properties and is used in outdoor signage for its clarity, brilliance, and transparency.